A new paper is out that has some interesting findings but the paper itself, and the press release form the authors (at University of Chicago) really goes overboard in misstating the findings. Here is the paper in Scientific Reports. I purposefully am not putting the title of the paper here in the post yet, because amazingly, even the title is misleading. This is not all they report as they also discuss various controls and other observations about these mice and their brains and their responses to the antibiotic treatment. We are fully cognizant of the fact that the findings reported herein are purely correlative and do not elucidate precise mechanism(s). These findings suggest the gut microbiota community diversity can regulate host innate immunity mechanisms that impact Aβ amyloidosis. No. These findings are consistent with that. They are also consistent with, for example, the antibiotics affecting microbes in the brain which in turn could affect inflammatory markers. Or microbes on the skin. Or in the blood. Or elsewhere. I don't see any evidence here for a causative connection between the gut microbes (which are certainly affected by these antibiotics) and the plaque. No no no no no no no no. No evidence that the perturbations in the gut microbes are directly influencing anything in the brain. It is a good model. But they need to be more careful with their wording. What? 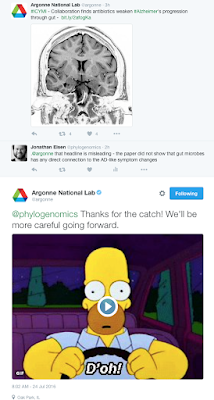 This "through changes in the gut microbiome" is just completely misrepresenting what was shown in the paper. 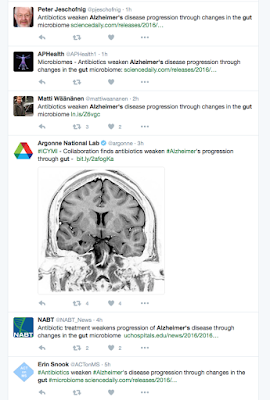 The study, published July 21, 2016, in Scientific Reports, also showed significant changes in the gut microbiome after antibiotic treatment, suggesting the composition and diversity of bacteria in the gut play an important role in regulating immune system activity that impacts progression of Alzheimer's disease. "There's probably not going to be a cure for Alzheimer's disease for several generations, because we know there are changes occurring in the brain and central nervous system 15 to 20 years before clinical onset," he said. "We have to find ways to intervene when a patient starts showing clinical signs, and if we learn how changes in gut bacteria affect onset or progression, or how the molecules they produce interact with the nervous system, we could use that to create a new kind of personalized medicine." Basically, saying there will be a cure for Alzheimer's. And then saying if we learn HOW (not if) gut microbes affect onset or progression, then we can better cure or treat this disease. This is just too bold and misleading for my taste. Nice paper. Interesting work and implications. 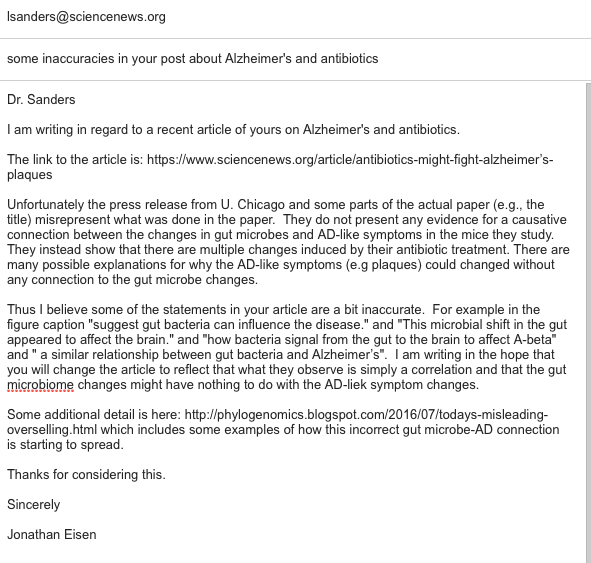 But it is misleading to say they have shown any causative connection between gut microbes and Alzheimer's in this paper and also very misleading to start to talk about how they will use this to lead to treatments or cures. Oh, and did I mention this was in mice not humans? 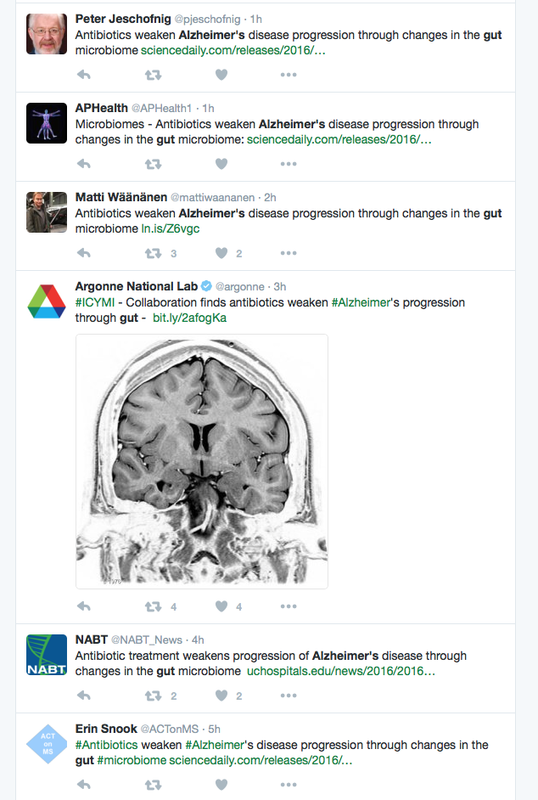 So how do they get from a correlative study in mice to how gut microbes affect progression of Alzheimer's in humans? Really this is not OK, even to hint at. And of course, which such misleading material in their own paper and in their PR it is not surprising that some of the reporting on this is going awry. And I am sure many more to come. Scientists have to be more careful with discussing and presenting the implications of their work. I love the microbiome field and the possible implications to me are enormous for the role of the microbiome in various areas of biology. But misrepresenting ones findings, especially when it comes to human diseases, is dangerous and bad for science and bad for the microbiome field. The author's of the paper and the people behind the PR at the University of Chicago should publish a correction of the PR and also publish a correction of their paper to correct the misleading representations. 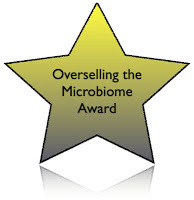 And for their misleading material in their paper and in the PR I am giving them a coveted "Overselling the Microbiome" award. Note - in Nov. 2018 I replaced the Storify with a Wakelet since storify is gone. @phylogenomics "Yet then through other papers of the paper" --> pages of the paper? 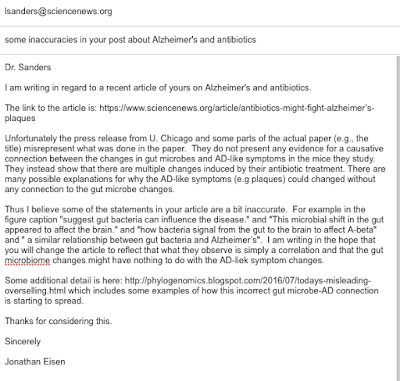 So many people posting links to the misleading articles where all that comes through (e.g., on Twitter) is the headline including the misleading information about the gut. Am responding to many of them but not all. PLAQUE FIGHTER A long dose of antibiotics reduced Alzheimer’s-related plaques (shown here in a human brain) in the brains of mice, results that suggest gut bacteria can influence the disease. A long course of antibiotics reduced the levels of a hallmark of Alzheimer’s disease in the brains of mice, possibly by changing the species of bacteria in the gut. This microbial shift in the gut appeared to affect the brain. Sisodia and colleagues don’t know how bacteria signal from the gut to the brain to affect A-beta, although their study raises one possibility. Sent an email to the author. From Claudiu Bandea who was having trouble posting his comment so asked me to do it. Whether the statements and conclusions drawn by Minter et al. are supported directly by their data or not becomes a minor issue if eventually proven to be correct, which is likely to be the case. I think that’s what the authors are banking on. Indeed, there is relevant data and observations on the etiology of Alzheimer’s, Parkinson’s, Huntington’s, ALS and other neurodegenerative diseases that link the microbes/viruses and innate immunity to the pathogenic mechanisms leading to these devastating diseases. 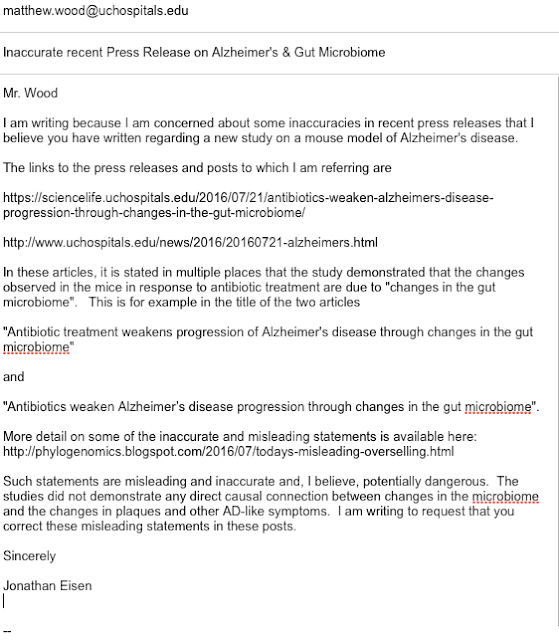 And, at least one of the authors of this article, Dr. Rudolf Tazi, had jumped on this bandwagon, albeit sporadically (see my PubMed Commons on a recent paper, “Amyloid-β peptide protects against microbial infection in mouse and worm models of Alzheimer's disease,” he co-authored (http://www.ncbi.nlm.nih.gov/pubmed/27225182). 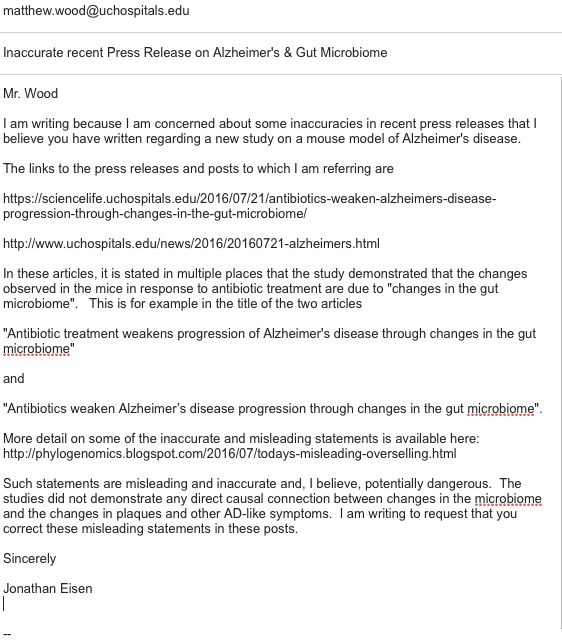 Perhaps the following study entitled “Reduction of Alzheimer's disease beta-amyloid pathology in the absence of gut microbiota” by Harach et al. (http://arxiv.org/abs/1509.02273), which is not mentioned in their paper, had given Minter et al. the confidence to advance their ‘visionary’ statements. And, clearly, these statements are within the framework a radical new theory on the etiology of Alzheimer’s, Parkinson’s, Huntington’s, ALS and other neurodegenerative diseases (http://biorxiv.org/content/biorxiv/early/2013/11/18/000604.full.pdf). This theory questions the validity of the ‘protein misfolding’ and ‘prion’ paradigms, which have directed most of the research in these field in the last few decades. It is not surprising, therefore, that this theory has yet to resonate with most researchers in the field who have promoted these paradigms. 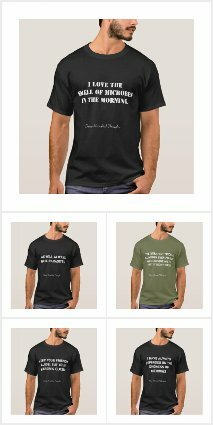 Nevertheless, with Dr. Tanzi’s ‘help’ and promotional work (J), it will certainly make some inroads soon. 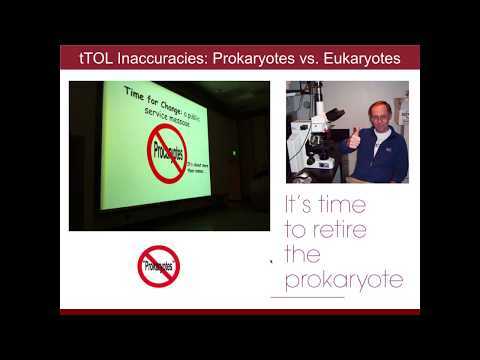 A path towards the extinction of "Impact Factor"